MC Xpress använder cookies för att förbättra användarupplevelsen. Genom att fortsätta använda sidan godkänner du detta. 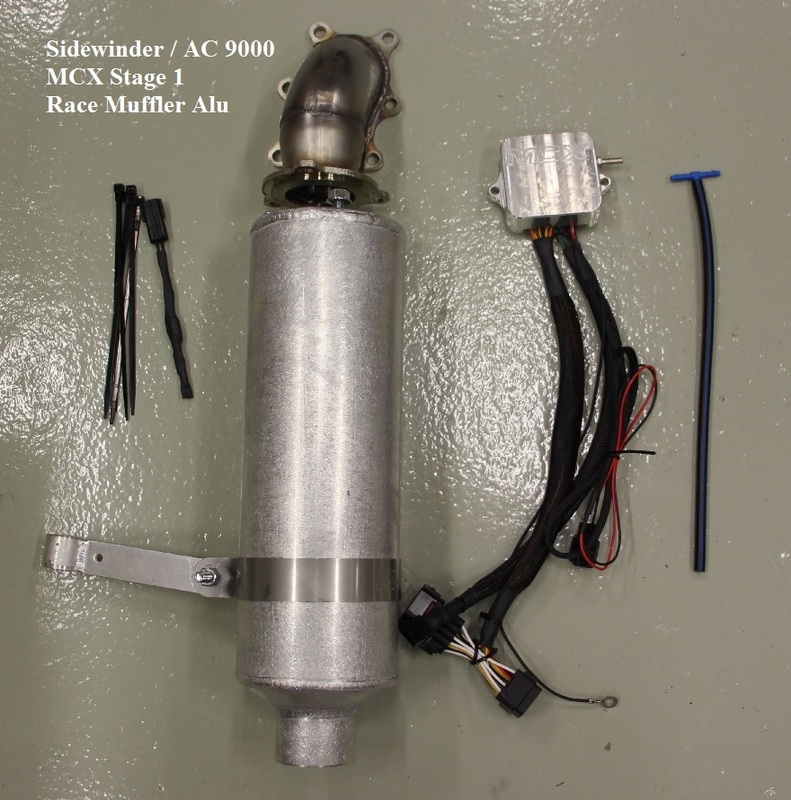 MCX Stage 1 upgrade kit with race muffler in aluminum. Power 225 hp. This race muffler and exhaust pipe is very light, only 2,80 kg. 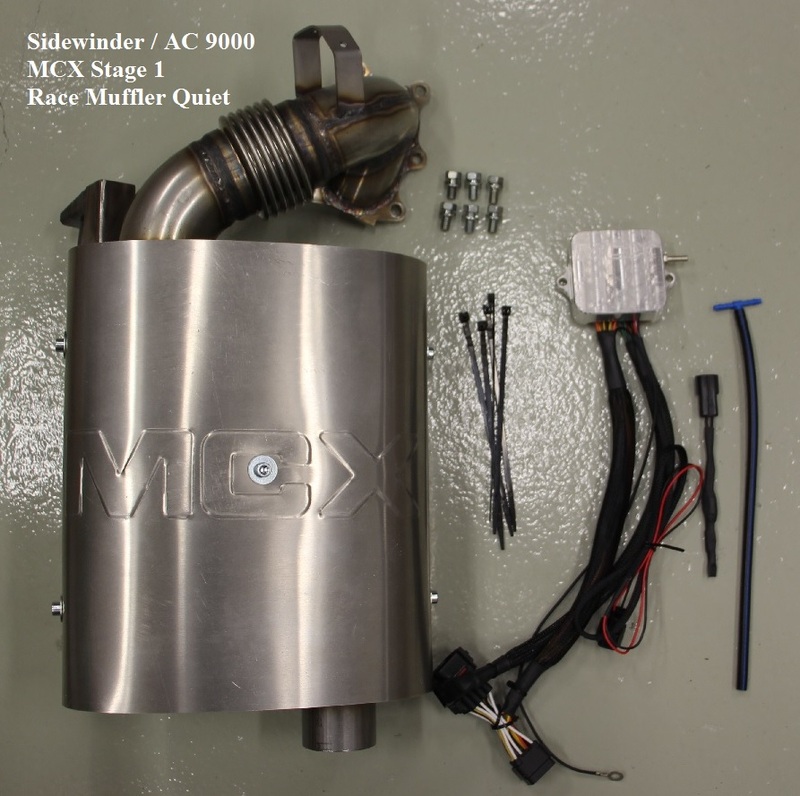 MCX Stage 1 upgrade kit with race muffler in stainless. Power 225 hp. The weight of this race muffler and exhaust pipe is 6,0 kg. It is 1,3 kg lighter than stock. The exhaust pipe diameter is 63 mm (=2,5″). This muffler creates low back pressure in combination with very efficient noice reduction. This muffler is insulated like the stock muffler to avoid heating problems inside the plastic fairings. MCX Stage 2 upgrade kit with race aluminum muffler. 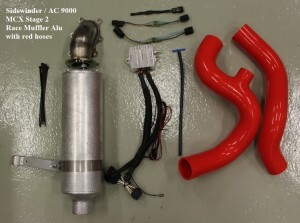 Like the stage one kit + some extra electric parts and new silicone air hoses to and from the intercooler. 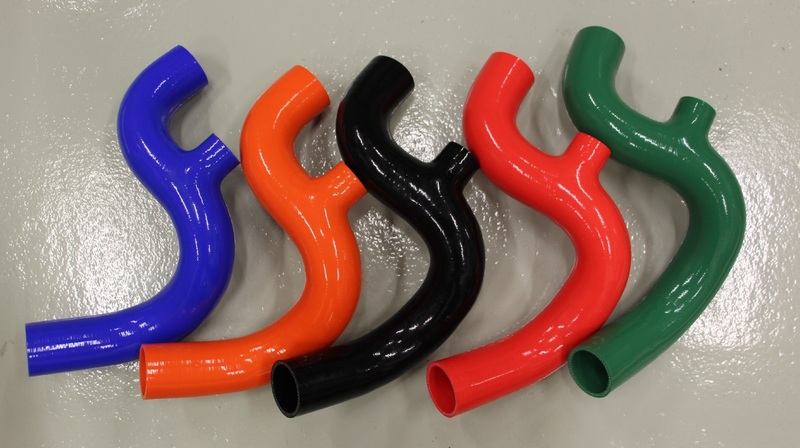 These hoses can stand much higher heat and pressure compared to the stock air hoses. Choose between five different colors to match your sled. MCX Stage 2 upgrade kit with race muffler in stainless steel. Blue, orange, black, red or green. The new turbocharged snowmobile Yamaha Sidewinder / Artic Cat ZX 9000 is the most powerful serial produced snowmobile ever build. And it has great potential to be even stronger. Yamaha claim the stock power to be about 180 hp. The truth is even better. When we test in our ASB calibrated and certfied Superflow dyno, we measure 192 to 194 every run. The stock turbo pressure at sea level is 65 kPa. (=This is 9,4 PSI). Very impressive for a stock snowmobile. One of the benefits with turbo is that it’s in these days possible to maitain the power at any altitude. The ECU gets informed about the barometric pressure and controls a valve (=Turbo Control Valve) so the same total pressure enters the engine. The baro pressure is about 100 kPa at sea level, and the turbo pressure 65. The total pressure will then be 165 kPa. At 1000 meter elevation, the baro pressure is 90 kPa. 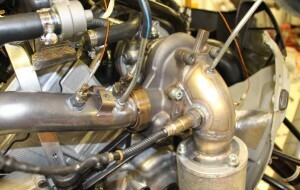 The turbo pressure will then be 75 kPa, so the total pressure will still be 165 kPa. At 2000 meter, the baro pressure is 80 kPa, and the turbo pressure 85 kPa ,total pressure 165. Is it actually more relevant to talk about total pressure than turbo pressure, so we will do that in the rest of the text below. To compare, a natural aspirated engine with 193 hp at sea level, has in best case 0,8 times the power at 2000 meter elevation (=154 hp). The back pressure of the stock muffler is O.K, and still, the power increase by installing a less restrictive muffler is rather much. Just by a switch to a racing muffler, the power at sea level goes up to 206-208 hp. The total pressure increase up to about 170 kPa due to that the wastegate hole in the turbine housing is a little to small for this setup. At altitude, the total pressure will drop down to 165 kPa again, and the power will be just over 200 hp. One problem with just installing a low restrictive racing muffler is that the air/fuel will be leaner. The MCX Gen 5 EFI-box is specially developed for controlling the total pressure and the opening time of the injector. The best lambda value on a turbo gasoline engine is between 0,80 to 0,85 at full throttle. We prefer to run rather rich to get as much safety limit as possible against detonation, so we aim for lambda 0,80. If we run richer than 0,80 the power drops rather rapidly, and if we run as rich as 0,73, the engine starts to misfire. 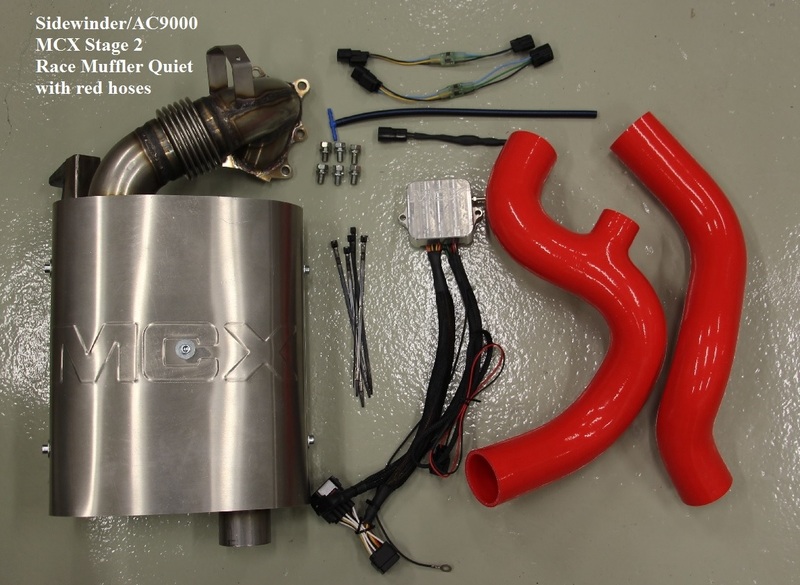 The MCX stage one kit will include our EFI-box that controls the fuel and the boost, and a racing muffler that is less restrictive. We have tested some different mufflers. All with low back pressure, but with different noise levels. We have set the total pressure to just over 180 kPa. The engine delivers 225 hp at this point. The stock ECU has a boost safety system that cut off the engine if the total pressure rise higher than about 185 kPa. With our stage one kit, this safety system is still active. This makes it very safe. 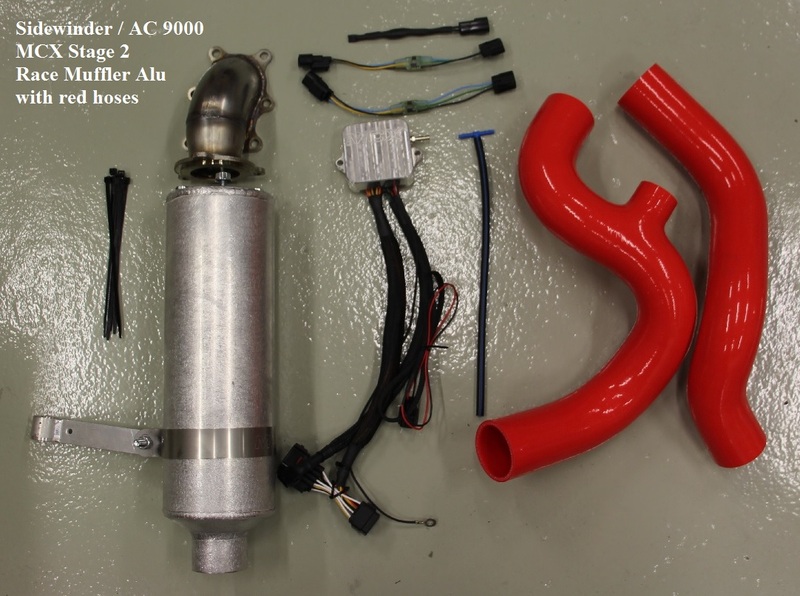 The turbo, fuel pump and injectors can handle more power. 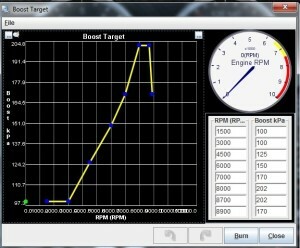 And the engine show no sign of detonation with higer boost when using pump gas 98 octane RON. So with just some more electronics to avoid the boost safety system, we can rise the pressure more. At just over 200 kPa total pressure, (=15 PSI turbo pressure at sea level) the injectors are fully open at lambda 0,80. The engine delivers 250 hp at this point. 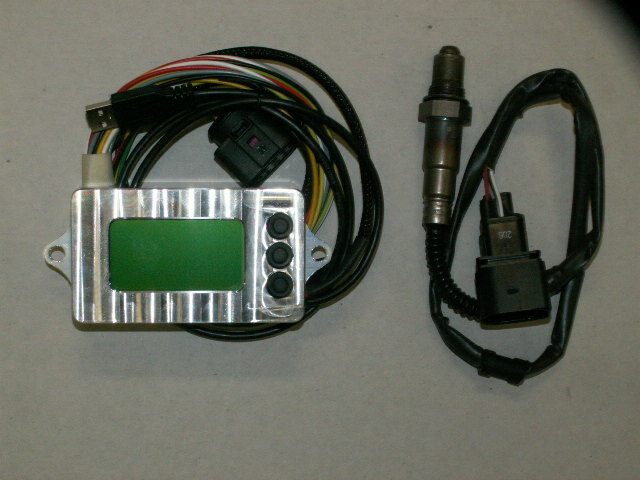 It is possible to make datalogging with the MCX EFI-box. 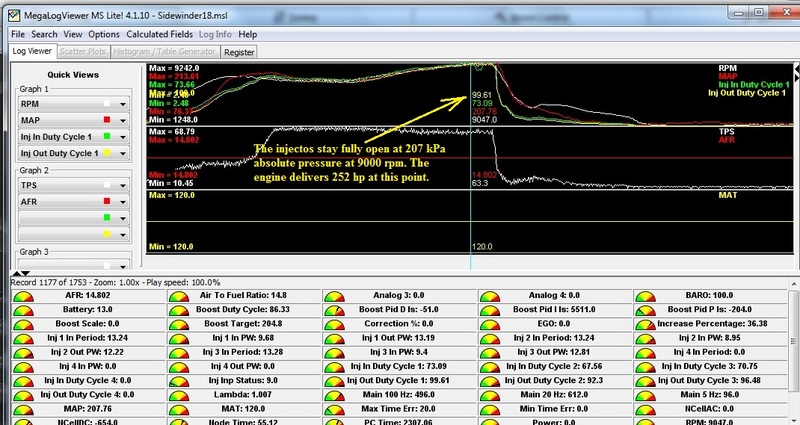 Here you can for instance study that the injectors stay fully open at 9000 rpm / 207 kPa total pressure. 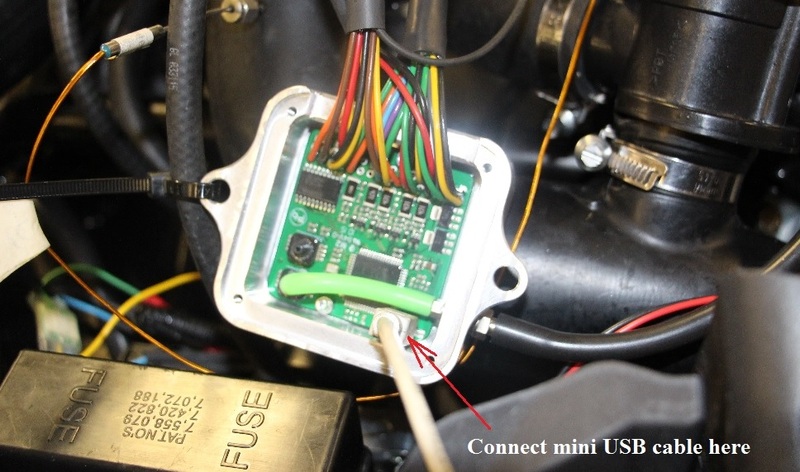 It is possible to make your own adjustments with the MCX EFI box. 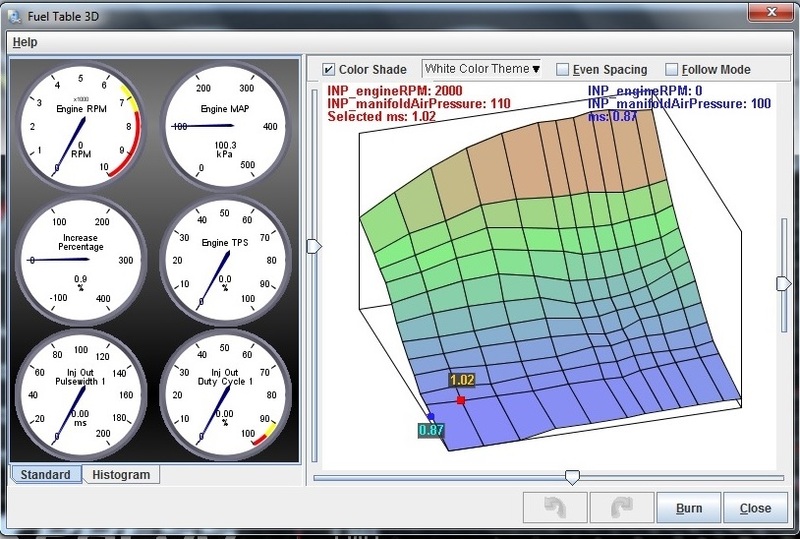 You can download different fuel maps, adjust the turbo pressure, adjust the fuel map etc. To be able to do this, you need a license for the Tuner Studio software program. Contact us for more info regarding this software if you are interested. Then you can do your own adjustments. A USB cable shall be connected between the PC and the EFI-box. A typical fuel map looks like this. A typical boost target map looks like this. 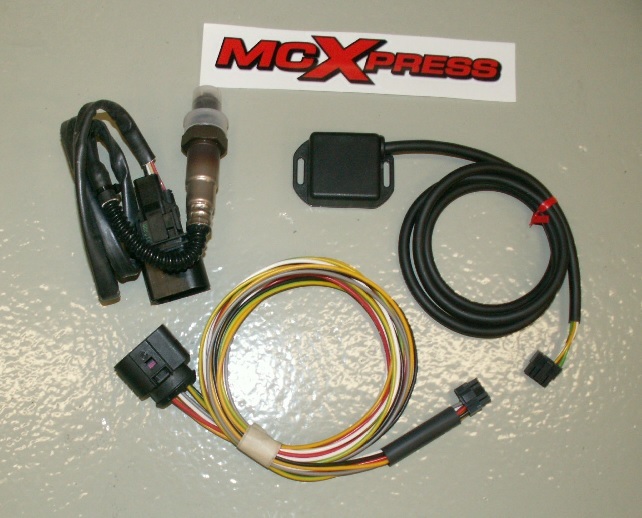 The MCX EFI-box has a lot of features. And just before the engine hits the rpm limiter, it is often a good choice to lower the pressure to avoid the limiter. When driving fast with low throttle, the boost often become higher than you want or need. The MCX EFI box then adjust down the boost to get better fuel economy and better drivability. It is possible to buy a blue tooth unit to the MCX EFI-box. The you can wireless make the changes you want. You can keep your android phone in your pocket and make datalogging, as you later can E-mail to yourself. Then it is easy to read for instance the rpm at full throttle when working with the clutches. Or you can use your android phone or tablet as a display. If you want a really professional gauge, the MCX display is a very nice tool. You can see rpm, absolute air pressure, lambda or A/F value, battery voltage, TPS and so on. You can also make datalogging and see 10 times/second what happens. At higher altitude, the turbo will have to work harder. The compressor of the turbo will have to pump more the higher up you go if the power shall be the same. So if you want more power than 250 hp at sea level, or if you want to keep 250 hp or more at high altitude, the stock turbo on the Sidewinder becomes to small. We are now testing bigger turbos and a bigger intercooler for more power. And the fuel system also need an update to reach more power. More information will follow soon…..